1,500 plus CPDRC inmatesremake the Thriller Video..
I’m sitting here at my wife place of employment attempting to keep my mind off my father’s heart operation which is currently underway in Idaho. I’m hoping he will pull though but not getting my hopes too high as the chances are not good. So here I am tiring to fill my brain with useless information and decided to login to youtube to find I video I heard about where they have over 1500 Filipion prisoners performing a remake of the Michael Jackson Thriller Video. If you have not seen this you are defiantly missing out! The girl, errr. Guy errr… it, whatever it is, is a REAL looker! Check it out for yourself well worth the bandwidth. 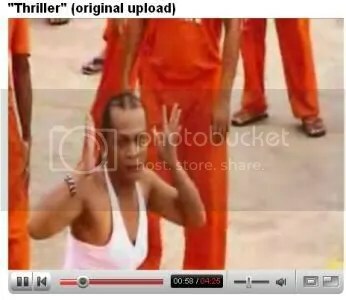 1 Response to 1,500 plus CPDRC inmatesremake the Thriller Video..
A Filipina friend sent it to me yesterday. I didn’t catch the guygirl at first. I must say it’s an interesting video. Hope your father’s operation is successful.